Well, since I am the only person out of my friends that knows how to make cakes, I decided to make my own birthday cake. 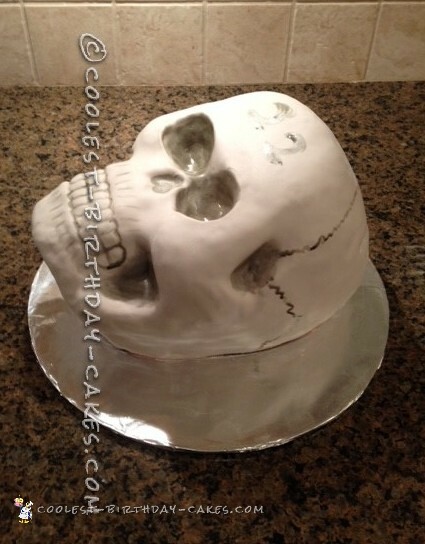 And with my obsession for skulls this cake just seemed perfect. 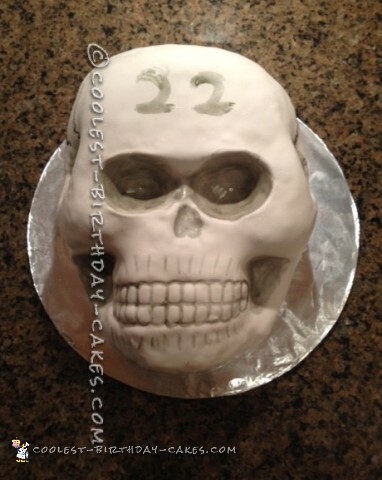 I didn’t want to pay the $50 for a Wilton skull pan so I decided to make my own. I went to Jo-Ann’s with my 40% off coupon and got a human sized foam head for $6. For my mold I folded a large piece of heavy duty foil in half and pressed and molded it to the foam head. I did this for the face and the back of the skull and viola, I made two pans. Each used about two boxes of mix and surprisingly enough the pans held up and the mold on the cake was perfect. I glued the two together with a lot of frosting and after some minor sculpting I crumb coated it and covered it in fondant. I used food coloring and some vodka to make the “paint” for the black parts and some anatomy pictures to make sure the sutures on the skull were anatomically correct. Everyone loved it and how gross it looked. It ended up being a huge hit and was gone by the end of the night!